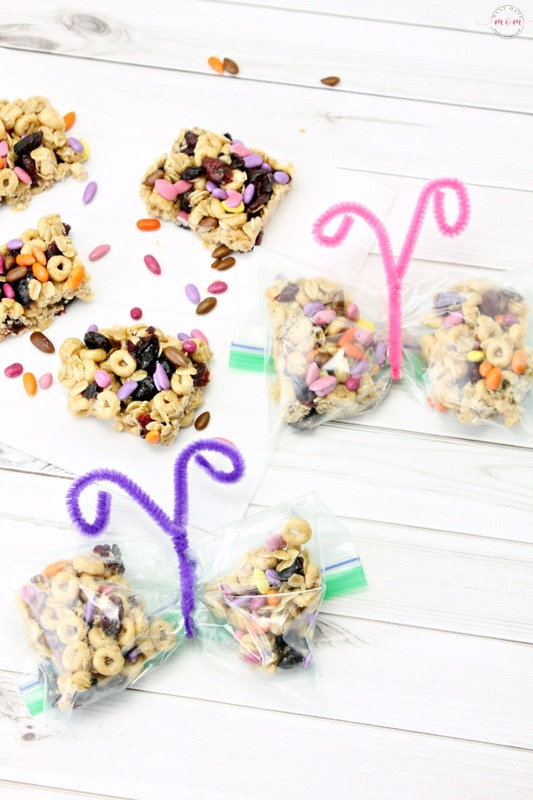 With back to school on the brain, I’ve combined an awesome new way to earn box tops for your child’s school with a yummy and healthy honey nut and oatmeal breakfast bar recipe to make hectic mornings less hectic and make it easier to earn those prized Box Tops for Education! Every year my children’s school holds two different box tops collections and the winning class gets a pizza or ice cream party. You can imagine the competitiveness that comes to the surface in our house, with 3 kids all vying for the box tops for their own classrooms. Luckily they all go to benefit the school, but some healthy competition is a great way to get my kids involved in raising money for their school. Luckily, there is a brand new way to earn even MORE box tops for your child’s school! It’s all done in a free app and I’m going to show you how to get free money for your child’s school for much-needed things like playground equipment and computers. 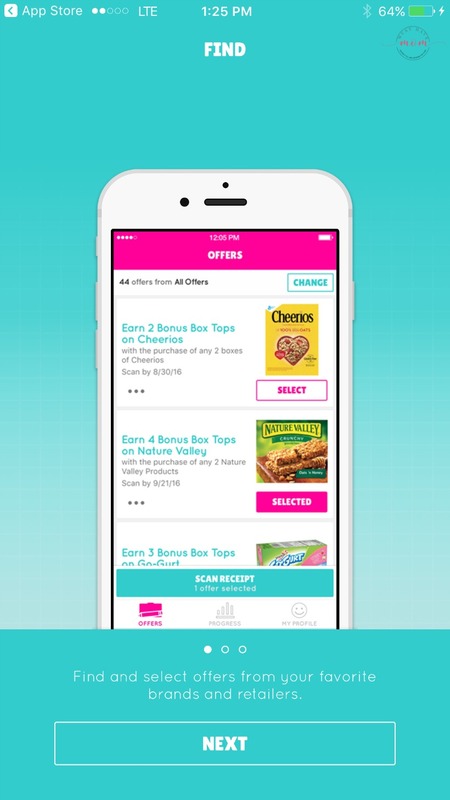 First, you need to download the Box Tops app. It’s free in the app store or the google play store and it is really easy to use too! Go download it now. Then simply find and select offers from your favorite brands and retailers. I chose the offer to earn 50 Box Tops when I buy any 5 products at Walmart. *Tip – to make this recipe in this post you’ll need 2 of the products on the list already! 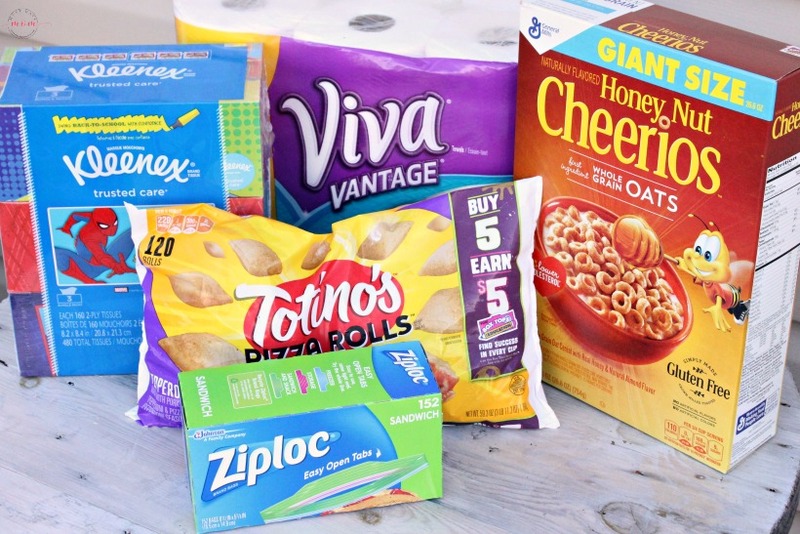 Print the full list of eligible products for the Buy 5, Earn $5 in Box Tops offer here. Now go shopping as normal. 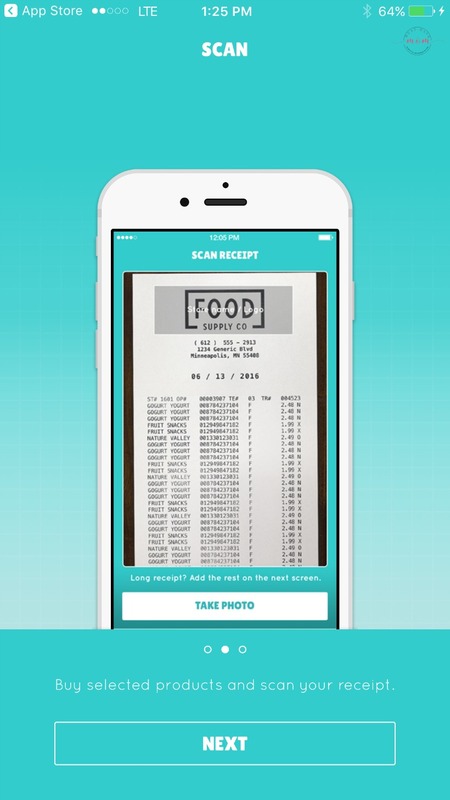 When you are done just scan your receipt to show that you’ve purchased the products. 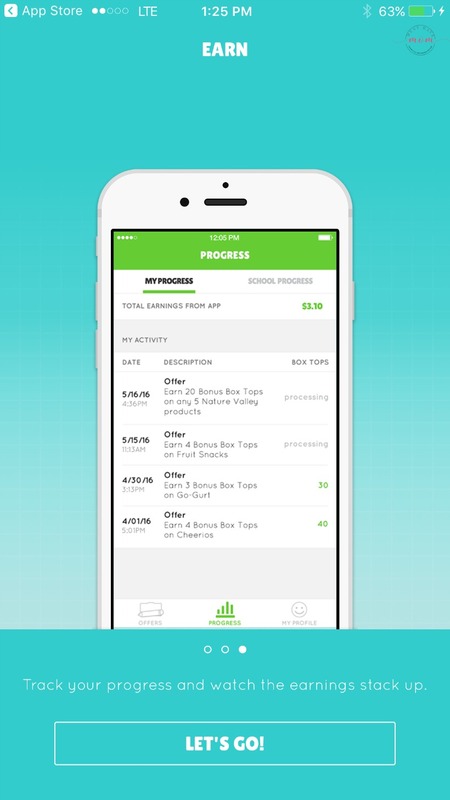 Then you can watch your progress as the offers are processed. When you download the app and sign up you choose your school that you’d like the Box Tops to go to. See how easy it is to earn extra money for your child’s school? I’d much rather buy products I’d be buying anyway and simply submit the Box Tops receipt and send in the Box Tops to the school than go door to door selling fundraiser products. Support the school with products you’d be buying anyway! It’s SO easy! 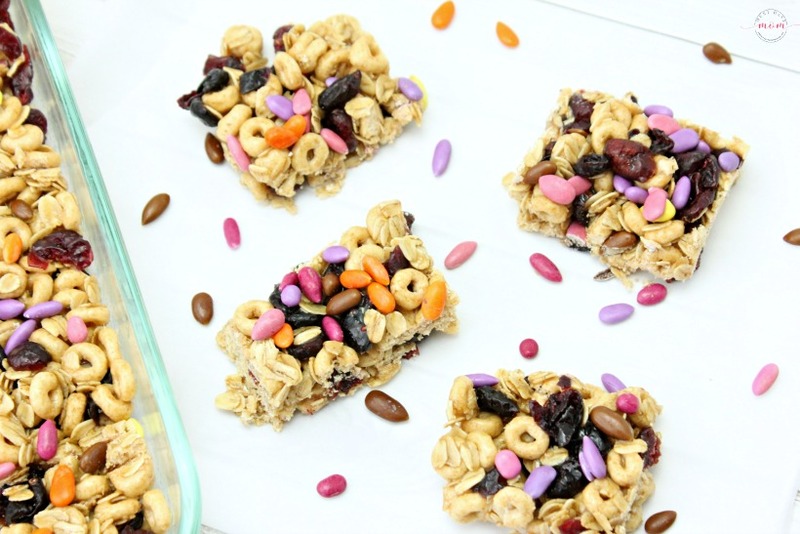 Now that you’ve got a GREAT reason to go shopping for Box Tops products, let’s make a healthy oatmeal breakfast bar recipe that will fuel the kids for a busy school day and cut down on the hectic mornings with a pre-made breakfast bar ready to go for those hungry tummies. 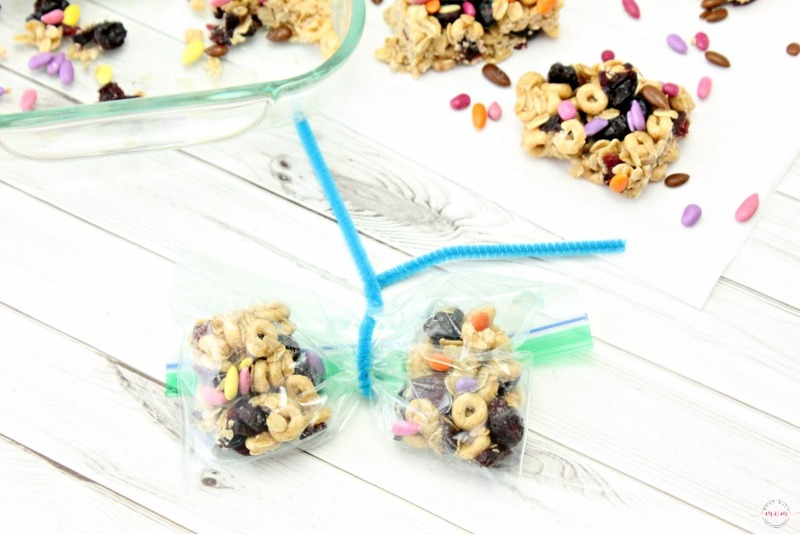 In addition to the ingredients listed in the printable recipe below, be sure to also pick up a package of Ziploc 152 count sandwich bags which are eligible for the bonus Box Tops offer and will also serve as your baggies to store the honey nut and oatmeal breakfast bars in. Plus, I’m going one step further and turning them into cute butterflies to greet my kids in the morning. 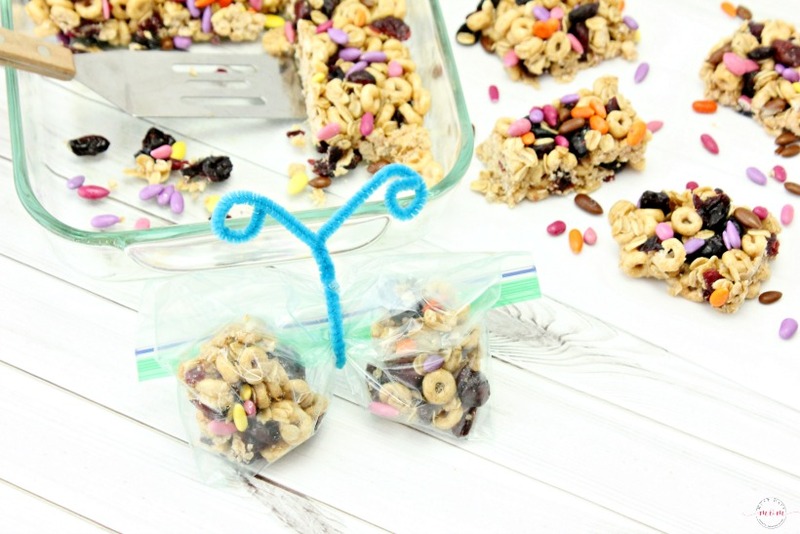 Don’t worry, it’s a simple addition of a pipe cleaner to the baggie and you’ll look like super mom. You’re welcome. 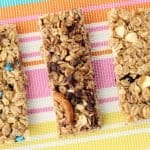 My homemade granola bars recipe has been a huge hit and this recipe is a spin-off of that classic family favorite. These will be loved by kids and adults alike. They are packed with nutrition to start the day off right on those busy mornings when sitting down to a homemade breakfast isn’t going to happen. Pair them with fruit or a protein shake for a rounded breakfast. They are really quick and easy to make too! They don’t take much time to make (10 minutes sound good?!) and then pop them in the fridge to harden. Then they are ready to eat! We store them in the fridge so they stay firm otherwise they tend to fall apart. 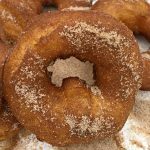 They are SO delicious and they are loved by the kids and us adults. After you slice them into squares it’s time to put them in baggies to store them in the fridge. Since I’m totally that mom that wants to do everything, but doesn’t have the time, I have a quick and easy hack to make you look like supermom. They’ll never know it took less than a minute to do. Place two squares inside a Ziploc sandwich bag, one on each side, and then fold over the extra bag at the top. Make sure you squeeze the air out! Then use a pipe cleaner to wrap it around the center and give it a twist. Then, curl the ends of the pipe cleaner so it resembles a butterfly’s antennae. 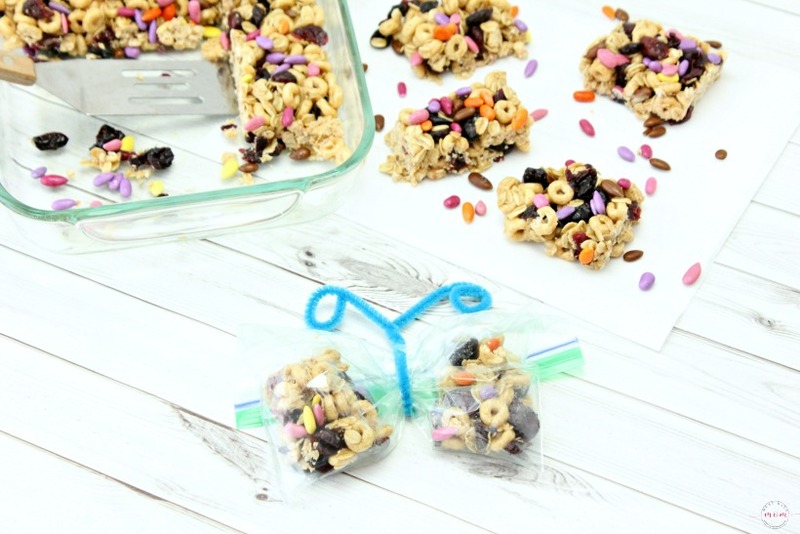 Now the honey oatmeal breakfast bars look like butterfly wings and the pipe cleaner looks like the body and antennae. Cute and EASY! 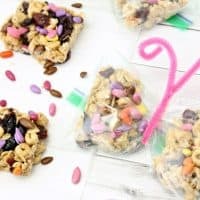 This recipe is bursting with flavor thanks to the strawberry and blueberry flavored craisins in it mixed with the honey nut Cheerios. It’s totally delicious and I’ve had them for breakfast on my way out the door more than a time or two. Make a batch and pop them in the fridge. Next time your kids wake up late and hungry, grab one for each of them and they can eat it on the go! Morning breakfast dilemma solved and you get to earn Box Tops for your school! 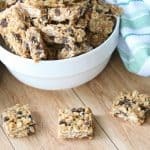 Healthy no bake honey oatmeal breakfast bars recipe for easy on the go breakfast. Spray an 8" pan with cooking spray to prevent bars from sticking. Set aside. 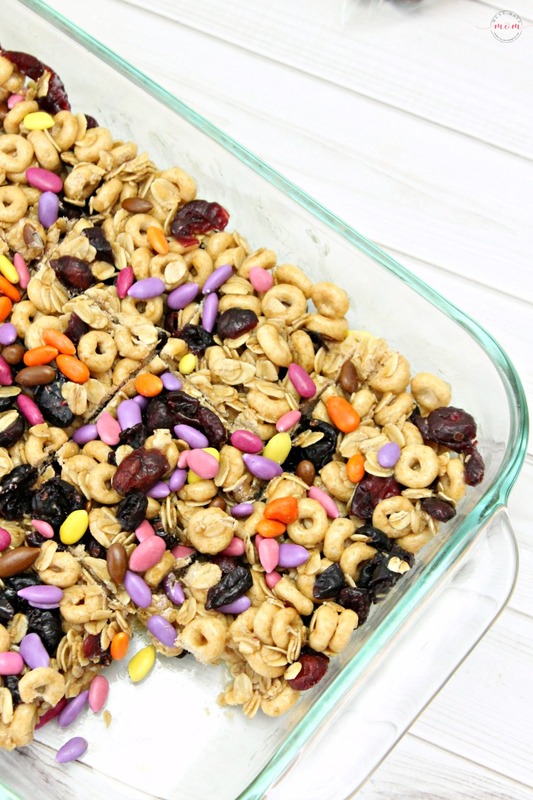 In a large bowl combine oats, cheerios, and craisins and set aside. In a saucepan over medium heat combine coconut oil, honey, and brown sugar. Heat to boiling and keep at a gentle boil for 30 seconds. Remove from heat and add vanilla. Stir to combine. Pour saucepan mixture over dry oat mixture and mix well. Pour finished mixture into your prepared pan and press down so it is packed tightly in the pan. Sprinkle chocolate covered sunflower seeds on the top. Place in fridge for one hour or until bars are firm. Cut into squares and put in baggies or create butterfly baggies with them. Store in the fridge until ready to eat. We absolutely hoard box tops. Thanks for the heads up on this! Time to get shopping. 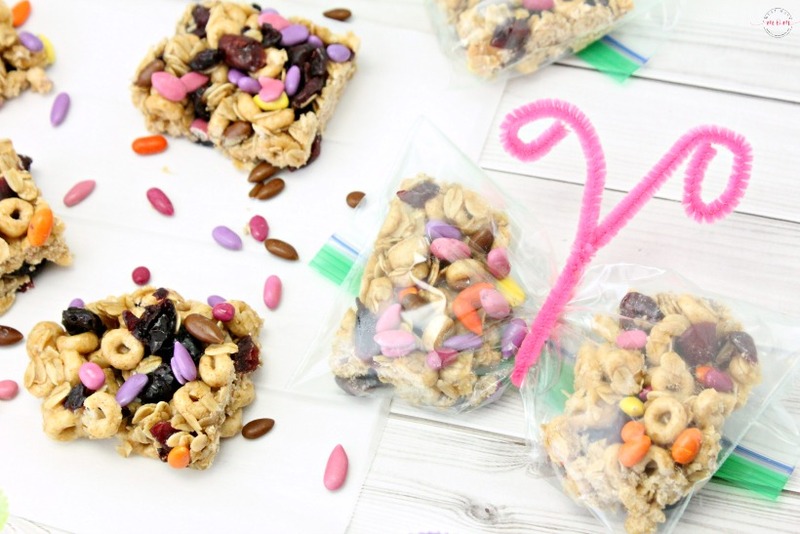 And also to make some awesome honey nut bars! 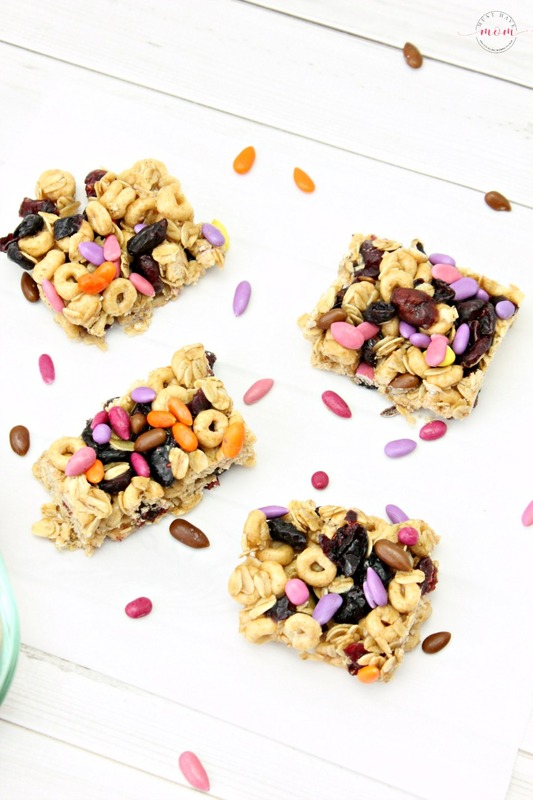 These Honey Nut and Oatmeal Breakfast Bars look amazing! I have never tried chocolate covered sunflower seeds. Yum! 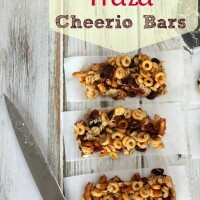 This bar recipe looks amazing! I know my kids would love it since they love all the ingredients individually. What a great recipe! I am definitely making this for the when they go back to school! What a fabulous recipe! I love that these are so colourful and engaging. I can see why kids would love to gobble them up! What a great back to school idea! These are SO pretty!! And they look so yummy. I will have to try these. Breakfast bars are always a hit in my house. These look so delicious and easy to make. I will have to pick up the ingredients I need to make some this weekend. 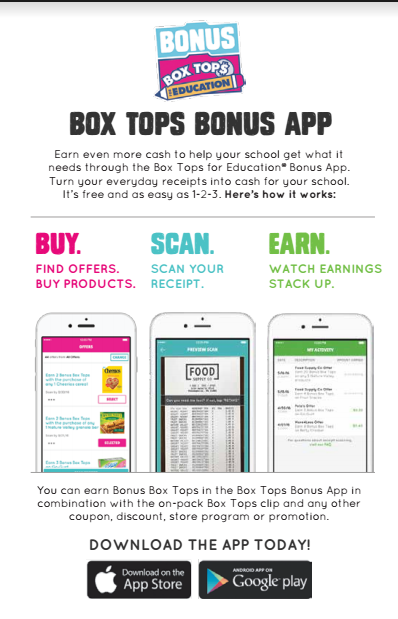 Box Tops for Education is a wonderful program and this app is such a great idea. 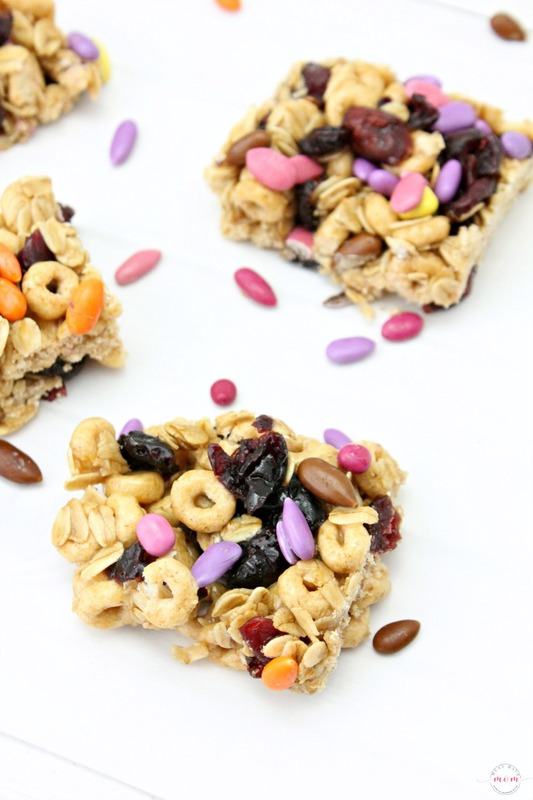 These breakfast bars look like a fun treat for the kids. Yes our school has really benefited from the Box Tops program! This is a recipe that I want to try. And I love how you made them look like little butterflies. Awwww! Thanks Dawn! They were a big hit with the kiddos! What a yummy breakfast recipe. The kids would love these. I love how you packaged them to look like butterflies.